Hantavirus pulmonary syndrome (HPS) is a rodent-borne viral infection caused by Hantaviruses and characterized by severe pulmonary illness with a high mortality rate. [1, 2, 3, 4, 5] The Hantaviruses comprise 1 of the 5 genera of the family Bunyaviridae, with more than 250 animal viruses. Hantaviruses derive their name from the Hantaan River in South Korea near which the prototypic virus was first isolated in 1978 from a striped field mouse. Old World Hantaviruses have been previously described to cause hemorrhagic fever with renal syndrome (HFRS). The clinical presentation of HFRS varies from subclinical, mild, and moderate to severe, depending in part on the causative agent of the disease. Old World Hantaviruses cause human infection in countries of the eastern hemisphere and worldwide, as listed in the table below. 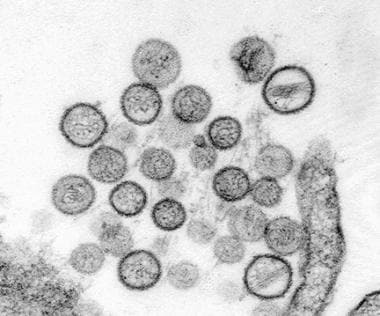 Hantavirus pulmonary syndrome was first recognized in the United States in 1993 during an investigation of a cluster of sudden and unexplained deaths that occurred in rural New Mexico. Investigation by the local health officials and researchers at the Centers for Disease Control and Prevention (CDC) discovered an outbreak of Hantavirus pulmonary syndrome in the Four Corners region of the United States (ie, New Mexico, Arizona, Colorado, Utah). The outbreak was quickly linked to a Hantavirus that is now called Sin Nombre (nameless) virus. 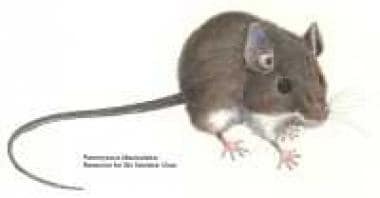 A reservoir of this virus was found in the regional deer mouse, Peromyscus maniculatus. Deer mouse, Peromyscus maniculatus. Courtesy of the Centers for Disease Control and Prevention. In the autumn of 1992, the weather phenomenon known as El Niño caused heavy precipitation in the Four Corners region of the United States, hypothetically resulting in the increased growth of berries, seeds, and nuts. A rapid rise in the rodent population resulted in this area. Aerosols contaminated by the infectious rodent urine and feces are thought to represent the principal vehicle for the transmission of Hantaviruses. The disease has also followed the bite of infected rodents and the consumption of food contaminated with infected rodent urine, droppings, or saliva. Unlike viruses in the other genera of the family Bunyaviridae that are transmitted to humans by the arthropod vector, Hantaviruses have a rodent host. Each Hantavirus is adapted to a single host rodent species. Spillover of a Hantavirus to another rodent host may occur in endemic areas; however, adaptation and long-term propagation of the Hantavirus in the new host does not occur. Hantaviruses are lipid-enveloped, negative-sense, single-stranded RNA viruses, 90-100 nm in diameter. Transmission electron micrograph of Sin Nombre virus. Courtesy of the Centers for Disease Control and Prevention. The small fragment encodes the viral nucleocapsid protein. The large fragment encodes the viral polymerase. The medium fragment encodes the envelope glycoproteins G1 and G2, regions of which are conserved among Hantaviruses, allowing the identification of new strains by reverse transcriptase polymerase chain reaction (RT-PCR) and immunohistochemistry. The basic lesion in Hantavirus pulmonary syndrome is increased pulmonary capillary permeability that leads to severe pulmonary edema. The pathogenesis of pulmonary edema in Hantavirus pulmonary syndrome is not well understood, although an immunologic mechanism is considered to play an important role. The lymphoblasts and the macrophages recruited to pulmonary tissue by the high viral burden may provoke a lymphokine-mediated activation of vascular endothelium, thereby increasing pulmonary capillary permeability. In 1999, Mori and colleagues used immunohistochemical staining to enumerate cytokine-producing cells (ie, monokines, such as interleukin [IL]-1α [IL-1α], IL-1β, IL-6, and tumor necrosis factor [TNF]-α [TNF-α], and lymphokines, such as interferon-γ, IL-2, IL-4, and TNF-beta) in tissues obtained at autopsy from subjects with Hantavirus pulmonary syndrome. High numbers of cytokine-producing cells were observed in the lung and spleen tissues of patients with Hantavirus pulmonary syndrome. These results suggest that local cytokine production may play an important role in the pathogenesis of Hantavirus pulmonary syndrome. Patients with Hantavirus pulmonary syndrome have very high levels of viremia at the onset of pulmonary edema and then rapidly clear the virus from plasma; however, pulmonary damage persists. These data suggest that the endothelial cells are not directly injured by the cytopathic effect of viral infection. In Hantavirus pulmonary syndrome, the patient's lung CD8+T cells are present in infiltrated alveolar walls. In 2004, Kilpatrick et al found significantly higher frequencies of viral-specific CD8+T cells in peripheral blood mononuclear cell (PBMC) samples from patients with severe disease than in those with moderate disease (44 [2%] and 9 [8%], respectively). These results support the hypothesis that virus-specific CD8+T cells contribute to Hantavirus pulmonary syndrome disease outcome. Impairment of endothelial cell's defense mechanisms against cytotoxic CD8+ T cells may be the mechanism of capillary leakage in Hantavirus pulmonary syndrome. Active suppression of immune T regulatory cells is probably involved in Hantavirus pulmonary syndrome pathogenesis. Hantaviral antigen and particles have been noted in the cardiac endothelium and interstitial macrophages in association with atypical myocarditis in Hantavirus pulmonary syndrome. These findings support the opinion that structural changes could also be responsible for myocardial depression and shock in Hantavirus pulmonary syndrome. Hantavirus pulmonary syndrome shock is probably related to an exacerbated immune response of CD8+ T cells producing cytotoxicity on infected endothelial cells; the presence of myocarditis and myocardial depression is induced by nitric oxide. The first outbreak in the Four Corners region of the southwestern United States occurred in 1993 following an El Niño year. A second strong El Niño phenomenon occurred in 1997-1998, resulting in an increased prevalence of Hantavirus pulmonary syndrome 5-fold above the baseline in the Four Corners region. Most hantavirus infections are caused by Sin Nombre virus, but cases of HPS caused by Bayou, Black Creek Canal, Monongahela, and New York viruses have been reported, and cases of domestically acquired hemorrhagic fever and renal syndrome caused by Seoul virus have also occurred. Rarely, hantavirus infections result in mild illness that does not progress to HPS. According to CDC a total of 637 cases of Hantavirus Pulmonary Syndrome have been reported in the United States through December 31, 2013, Of these, 606 cases occurred from 1993-onward, following the initial identification of HPS, whereas 31 cases were retrospectively identified. Cases have been reported in 34 states. More than 95% of reported cases have occurred in states west of the Mississippi River. About three-quarters of patients with HPS have been residents of rural areas. Cases have been reported in 34 states. See map below. Centers for Disease Control and Prevention: Cumulative case count of Hantavirus pulmonary syndrome in the United States per state, valid as of December 31, 2013. Courtesy of the Centers for Disease Control and Prevention. Since the original description of Hantavirus pulmonary syndrome due to Sin Nombre virus, cases of Hantavirus pulmonary syndrome–like disease outside the range of P maniculatus have led to the isolation of additional distinct Hantaviruses in the United States, as summarized in Table 2 below. Hantavirus pulmonary syndrome in the United States is largely due to infection with the Sin Nombre virus. Other Hantaviruses have been implicated in only a handful of cases in isolated locations. In 2000, Kuenzi et al found that 7 of 35 (20%) deer mice captured from 28% of the urban and suburban homes of southwestern Montana were seropositive for antibody to Sin Nombre virus. The infected mice were mostly adult males captured in the spring and fall. Outside of North America, numerous individual cases and small clusters of HPS cases have been reported in Argentina, Bolivia, Brazil, Chile, Ecuador, Paraguay, Panama and Uruguay and Venezuela. Large outbreaks have been rare and have usually been associated with human disturbance and land-use changes or with unusual environmental events such as increased rainfall or periodic bamboo flowering. In Colombia, Costa Rica and Mexico, rodents carrying viruses similar to Sin Nombre virus found in the United States have been found, but these particular hantaviruses have not been associated with disease in humans. Hantaviruses linked to sporadic cases or limited outbreaks of Hantavirus pulmonary syndrome in other regions of the western hemisphere are listed below with their rodent host. Through December 31, 2013, 36% of the 637 cases of Hantavirus pulmonary syndrome reported in the United States have resulted in death. All races are susceptible to Hantavirus pulmonary syndrome. In the United States, Whites currently account for 78% of all cases. American Indians account for about 18% of cases, African Americans for 2% of cases, and Asians for 1% of cases. About 20% of HPS cases have been reported among Hispanics (ethnicity considered separately from race). To date, 63% of reported cases were in males, and 37% were in females. The mean age of confirmed case patients is 37 years (range, 6-83 y). Vinh DC, Embil JM. Hantavirus Pulmonary Syndrome: A Concise Clinical Review. South Med J. 2009 May 7. [Medline]. Figueiredo LT, Moreli ML, de-Sousa RL, Borges AA, de-Figueiredo GG, Machado AM, et al. Hantavirus pulmonary syndrome, central plateau, southeastern, and southern Brazil. Emerg Infect Dis. 2009 Apr. 15(4):561-7. [Medline]. [Full Text]. MacNeil A, Ksiazek TG, Rollin PE. Hantavirus pulmonary syndrome, United States, 1993-2009. Emerg Infect Dis. 2011 Jul. 17(7):1195-201. [Medline]. Avšic-Županc T, Saksida A, Korva M. Hantavirus Infections. Clin Microbiol Infect. 2013 Jun 24. [Medline]. Mori M, Rothman AL, Kurane I, et al. High levels of cytokine-producing cells in the lung tissues of patients with fatal hantavirus pulmonary syndrome. J Infect Dis. 1999 Feb. 179(2):295-302. [Medline]. Kilpatrick ED, Terajima M, Koster FT, et al. Role of specific CD8+ T cells in the severity of a fulminant zoonotic viral hemorrhagic fever, hantavirus pulmonary syndrome. J Immunol. 2004 Mar 1. 172(5):3297-304. [Medline]. [Full Text]. Núñez JJ, Fritz CL, Knust B, Buttke D, Enge B, Novak MG, et al. Hantavirus infections among overnight visitors to Yosemite National Park, California, USA, 2012. Emerg Infect Dis. 2014 Mar. 20(3):386-93. [Medline]. [Full Text]. Armstrong LR, Zaki SR, Goldoft MJ, Todd RL, Khan AS, Khabbaz RF. Hantavirus pulmonary syndrome associated with entering or cleaning rarely used, rodent-infested structures. J Infect Dis. 1995 Oct. 172(4):1166. [Medline]. Akram SM, Huang B. Hantavirus Cardiopulmonary Syndrome. 2018 Jan. [Medline]. [Full Text]. Hartline J, Mierek C, Knutson T, Kang C. Hantavirus infection in North America: a clinical review. Am J Emerg Med. 2013 Jun. 31(6):978-82. [Medline]. Lagerqvist N, Hagström Å, Lundahl M, Nilsson E, Juremalm M, Larsson I, et al. Molecular Diagnosis of Hemorrhagic Fever with Renal Syndrome Caused by Puumala Virus. J Clin Microbiol. 2016 May. 54 (5):1335-9. [Medline]. [Full Text]. Ketai LH, Williamson MR, Telepak RJ, Levy H, Koster FT, Nolte KB. Hantavirus pulmonary syndrome: radiographic findings in 16 patients. Radiology. 1994 Jun. 191(3):665-8. [Medline]. Dietl CA, Wernly JA, Pett SB, et al. Extracorporeal membrane oxygenation support improves survival of patients with severe Hantavirus cardiopulmonary syndrome. J Thorac Cardiovasc Surg. 2008 Mar. 135(3):579-84. [Medline]. Vial PA, Valdivieso F, Ferres M, Riquelme R, Rioseco ML, Calvo M, et al. High-dose intravenous methylprednisolone for hantavirus cardiopulmonary syndrome in Chile: a double-blind, randomized controlled clinical trial. Clin Infect Dis. 2013 Oct. 57(7):943-51. [Medline]. [Full Text]. Watson DC, Sargianou M, Papa A, Chra P, Starakis I, Panos G. Epidemiology of Hantavirus infections in humans: a comprehensive, global overview. Crit Rev Microbiol. 2014 Aug. 40(3):261-72. [Medline]. Cho HW, Howard CR. Antibody responses in humans to an inactivated hantavirus vaccine (Hantavax). Vaccine. 1999 Jun 4. 17(20-21):2569-75. [Medline]. da Rosa Elkhoury M, da Silva Mendes W, Waldman EA, Dias JP, Carmo EH, Fernando da Costa Vasconcelos P. Hantavirus pulmonary syndrome: prognostic factors for death in reported cases in Brazil. Trans R Soc Trop Med Hyg. 2012 May. 106(5):298-302. [Medline]. Abbott KD, Ksiazek TG, Mills JN. Long-term hantavirus persistence in rodent populations in central Arizona. Emerg Infect Dis. 1999 Jan-Feb. 5(1):102-12. [Medline]. Abel Borges A, Figueiredo LT. Mechanisms of shock in hantavirus pulmonary syndrome. Curr Opin Infect Dis. 2008 Jun. 21(3):293-7. [Medline]. Bartholomew DM, Hansen LA, Frank JJ, Farver DK. Case report of hantavirus pulmonary syndrome and review. S D Med. 2007 May. 60(5):189-91, 193-5. [Medline]. Brillman J, Talan DA, Moran GJ, Pinner R. Update on emerging infections from the Centers for Disease Control and Prevention. Hantavirus pulmonary syndrome--five states, 2006. Ann Emerg Med. 2006 Nov. 48(5):593-4; discussion 594-5. [Medline]. CDC. Update: hantavirus pulmonary syndrome--United States, 1999. MMWR Morb Mortal Wkly Rep. 1999 Jun 25. 48(24):521-5. [Medline]. Chang B, Crowley M, Campen M, Koster F. Hantavirus cardiopulmonary syndrome. Semin Respir Crit Care Med. 2007 Apr. 28(2):193-200. [Medline]. Chin C, Chiueh TS, Yang WC, et al. Hantavirus infection in Taiwan: the experience of a geographically unique area. J Med Virol. 2000 Feb. 60(2):237-47. [Medline]. Douglass RJ, Calisher CH, Bradley KC. State-by-state incidences of hantavirus pulmonary syndrome in the United States, 1993-2004. Vector Borne Zoonotic Dis. 2005 Summer. 5(2):189-92. [Medline]. 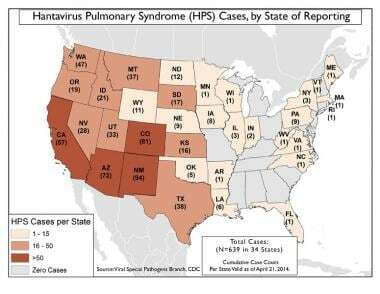 Hantavirus pulmonary syndrome--five states, 2006. MMWR Morb Mortal Wkly Rep. 2006 Jun 9. 55(22):627-9. [Medline]. Hjelle B, Glass GE. Outbreak of hantavirus infection in the Four Corners region of the United States in the wake of the 1997-1998 El Nino-southern oscillation. J Infect Dis. 2000 May. 181(5):1569-73. [Medline]. Koraka P, Avsic-Zupanc T, Osterhaus AD, Groen J. Evaluation of two commercially available immunoassays for the detection of hantavirus antibodies in serum samples. J Clin Virol. 2000 Sep 1. 17(3):189-96. [Medline]. Maeda K, West K, Toyosaki-Maeda T, et al. Identification and analysis for cross-reactivity among hantaviruses of H-2b-restricted cytotoxic T-lymphocyte epitopes in Sin Nombre virus nucleocapsid protein. J Gen Virol. 2004 Jul. 85(Pt 7):1909-19. [Medline]. Maes P, Clement J, Gavrilovskaya I, Van Ranst M. Hantaviruses: immunology, treatment, and prevention. Viral Immunol. 2004. 17(4):481-97. [Medline]. Mertz GJ, Hjelle B, Crowley M, Iwamoto G, Tomicic V, Vial PA. Diagnosis and treatment of new world hantavirus infections. Curr Opin Infect Dis. 2006 Oct. 19(5):437-42. [Medline]. Mills JN, Corneli A, Young JC, et al. Hantavirus pulmonary syndrome--United States: updated recommendations for risk reduction. Centers for Disease Control and Prevention. MMWR Recomm Rep. 2002 Jul 26. 51(RR-9):1-12. [Medline]. Rivers MN, Alexander JL, Rohde RE, Pierce JR Jr. Hantavirus pulmonary syndrome in Texas: 1993-2006. South Med J. 2009 Jan. 102(1):36-41. [Medline]. Seitsonen E, Hynninen M, Kolho E, et al. Corticosteroids combined with continuous veno-venous hemodiafiltration for treatment of hantavirus pulmonary syndrome caused by Puumala virus infection. Eur J Clin Microbiol Infect Dis. 2006 Mar 21. [Medline]. Terajima M, Hayasaka D, Maeda K, Ennis FA. Immunopathogenesis of hantavirus pulmonary syndrome and hemorrhagic fever with renal syndrome: Do CD8+ T cells trigger capillary leakage in viral hemorrhagic fevers?. Immunol Lett. 2007 Nov 15. 113(2):117-20. [Medline]. Knust B, Rollin PE. Twenty-year summary of surveillance for human hantavirus infections, United States. Emerg Infect Dis. 2013 Dec. 19(12):1934-7. [Medline]. [Full Text]. Characteristics of 465 Hantavirus pulmonary syndrome cases in the United States, March 26, 2007. Courtesy of the Centers for Disease Control and Prevention. Histopathology of the lung in Hantavirus pulmonary syndrome. Courtesy of the Centers for Disease Control and Prevention.